As i’m now back at uni, I thought it would be a fun idea to do another ‘what’s in my bag’ post as I haven’t actually shown you guys what I carry around with me in my bag for uni and I really enjoy reading these kind of posts. I’m so nosey ha! I’d been thinking about getting a new bag for uni, as all my other bags were either too big or too small so when I was contacted by the lovely folks at Bagable to review a bag of my choice I obviously jumped at the chance. Bagable is a website I had not come across before, but they stock a wide variety of different bag brands for both men and women at amazingly affordable prices. After scouting their website I finally chose this adorable Nica Lila Tote Bag as I thought it would be the perfect sized bag for me to use mainly for uni and i’m so happy with it. Tote bags are my favourite style of bags as you can easily hook them onto your shoulder or over your arm without them being uncomfortable and this one definitely is comfortable. It’s so spacious and fits all the necessary bits and bobs I need for uni without it being too big or bulky. It has loads of little compartments to hide or store smaller items with a little zip pocket inside, a compartment for your phone and also a pocket on the front of the bag with this really cute clasp detailing, which is actually quite spacious and is handy to just chuck things like lip balms into. This bag is available in a wide range of colours and i’m really pleased I chose the tan, as I was having a hard time deciding between the tan or the black but I thought instead of playing it safe with black i’d go for the tan as pretty much all the bags I own are black ha! Now let’s move onto what I actually carry inside my bag! Now the first item is my MacBook, which I don’t actually carry in my bag but I do take it to uni as I often need it for lessons and stuff but I carry it in it’s own travel bag as that one is a lot more padded and protects my laptop from any bumps it may get during the day. Next up is my Purse, which is from Primark would you believe! I always carry my purse as I have to pay for parking, lunch and sometimes petrol to get me home. 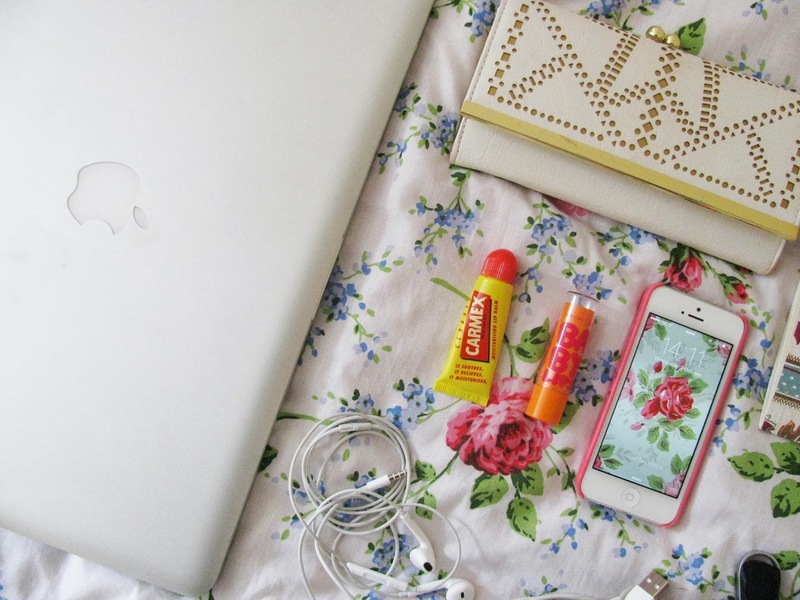 The next two products probably don’t come as a shock to you, good old beauty blogger right here – these are the Carmex Lip Balm and the Maybelline ‘Cherry Me’ Babylips (review here). I always have a lip balm or two knocking around in my bag and as I don’t really carry a makeup bag these normally get thrown in my bag somewhere! The next few items are ones that I always have to have with me, one of course being my iPhone 5 (post here) I can’t leave the house without this thing as i’m always tweeting on the go or instagraming what i’ve had for lunch (sad I know!) I also carry my Ear Phones if I want to listen to music whilst doing my work at uni and my Charger Cable as I use this to connect my phone to my radio in my car and if I need to charge my phone. The next item is this Topshop Notebook, which I bought a while back when I was on placement in London and these have proved really handy when it comes to taking notes and jotting down idea’s during lessons seeing as I have a memory of a frog! Next up is another obvious one, my Car Keys – if I didn’t carry these my car wouldn’t work! I also have my usb attached to them if I ever need to save anything off the uni computers and it saves me losing it all the time. Last but not least is my Pencil Case, where I store a few stationary bits and pieces, rather than having random pens and pencils floating around in the bottom of my bag. So that is everything I carry in my bag for uni and it fits really well into my bag with a little more space for any other bits and bobs, like books or a jacket/cardigan! 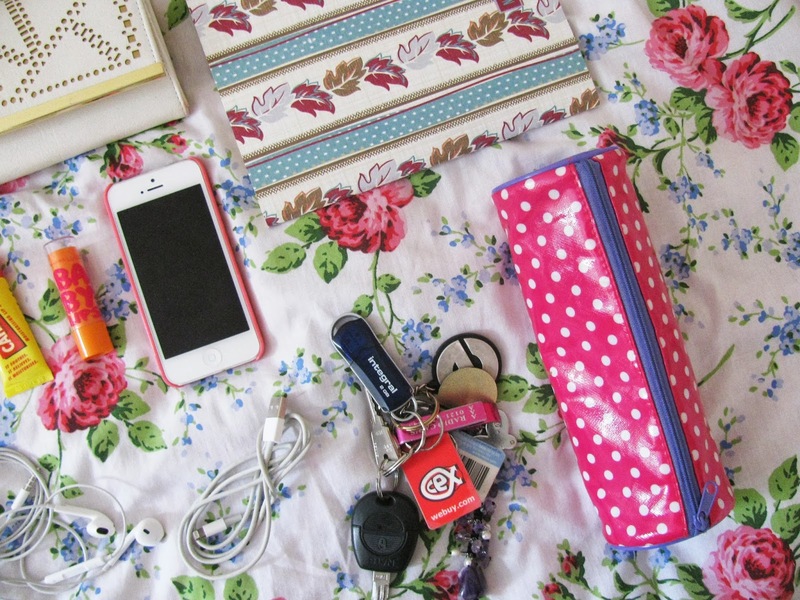 What’s in your uni bag? *Bag was sent to me for review, but my opinion is 100% honest as always. Previous Post How Much is Your Face Worth?